There are high-tech adventures in theaters to strengthen one’s New Year’s resolve. Many of them have the word “courage” in the description. I recommend Spotlight. It is the most encouraging movie I have seen in forever. Thomas Aquinas offers a helpful description of courage. This thirteenth-century writer is the authoritative theologian for the Roman Catholic Church. I have learned tricks over years of trying to entice Protestant students to read him. The section of his classic Summa Theologiae that hooks students is on virtues and vices. 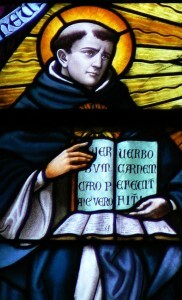 No one parses the fine distinctions between, for example, jealousy and backbiting, or anger and spite, or temperance and insensibility like Thomas Aquinas. It only takes a few years in a real congregation with actual people to note the almost infinite variety of vice and virtue. Thomas continues in a tradition to treat fortitude (courage) as one of the four basic or “cardinal” virtues. Along with practical wisdom, temperance, and justice, courage is one of four habits of being that orient a person to understand who and where they are, and how their corner of the world fares in relation to the pivotal aspects of life that make life good. To understand what Thomas means by the cardinal, or orienting, virtues, think of the opposite: an intentionally disorienting story. Some writers try intentionally to disorient people, for laughs, or to make life appear utterly random. Such writing can make you temporarily unable to regain your balance. Courage is one of four virtues that may allow a person to regain her bearings. Courage is often necessary to determine what is just, or practical, or temperate, particularly when people with power around you are impractical, intemperate, or unjust. Thomas further explains that each of the four cardinal virtues balance between two excesses. Courage is a habit of being between foolhardiness, on the one hand, and, on the other, living fearfully. Sometimes a person has to cultivate courage in order to point out what is nonsensical. Or to point out what is obscene. The word obscene names something so disorienting that it assaults your senses, rendering you senseless. Here is one local example. Several years ago this newspaper ran an article on how some executives at Duke University had given themselves large bonuses during a period when supposedly everyone at the university needed to “tighten our belts” and do with less. While librarians and surgeons and nurses and teachers were doing much more with much less, some higher-ups received giant gold checks. The week the story broke, one distinguished colleague saw me in our office hallway in a tiara and black velvet dress. He asked me what in the world I was doing. I told him I was on my way to perform street theater to draw attention to the scandal. He shook his head and said, “It really is obscene.” He did not go on record, but I used his word “obscene” repeatedly in public to characterize the mess. The most courageous thing I have done ever was declare publicly that my marriage was untenable. The most brazen thing I have done ever was participate in a group effort to whistle-blow, at my employer, wearing a tiara. But we would not even have had a whistle to blow without old-fashioned, journalistic muckraking. In his description of courage, Thomas Aquinas thinks through how courage intertwines with endurance. Spotlight relates with similar attention to detail the actual story about a team of journalists with the Boston Globe who together discover the courageous patience sufficient to trace a pattern of disorienting deceit. Boston clergy, lawyers and other public figures sustained a meticulously crafted, multi-faceted cover-up of the fact that at least a thousand children had been sexually violated by over a hundred church leaders in the Boston area alone. The film depicts the slow, steady, journalistic tenacity necessary for raking up such stealthily buried muck. The film also shows how a brilliantly lying set of liars can hone the subtle skills of manipulation and intimidation. Each journalist in the story has to develop the courage both to note subtly delivered threats and to continue, even while noting the power behind these threats, the mundane but heroic tasks to expose truth. An important part of the film is how Boston is a “small town,” and how a key, regional institution may develop a shield of amoral invisibility. “The Church” had become a given, an indisputable “Good,” capital G, both uniting and silencing people. Spotlight is in this way a real story comparable to Henrik Ibsen’s 1882 play “An Enemy of the People.” Ibsen also relates the stakes of telling the truth in a town living a lie. Both stories vividly show why courageously independent, local journalism is vital for living well.